Hurghada Property Sales - Holiday Homes and Apartments for sale in Hurghada. We offer you a wide range of quality Hurghada property for sale. Whether you are looking for your ideal holiday home, or investment properties, in and around the Hurghada area (includes Arabia - Hadaba - El Kawther - Mubarak 7 - Sahl Hasheesh - El Gouna - Makadi Bay - Al Ahyiaa - Intercontinental ). Hurghada Acorn can offer you apartment, villa, or duplex for sale. If you don't see what you are looking for, just send us an enquiry form, stipulating your requirements, and we will provide you with a selection of Hurghada properties for sale, that meet your criteria. A great opportunity, to own in this sought after,quiet village, in the heart of Hurghada. The apartment for sale, is located in Serafy Village, Hurghada. A purpose-built secure estate within walking distance of the 5* Sunrise Holiday Resort, and the main centre of Sakalla, Hurghada, with its supermarkets, shops, cafes, bars and restaurants. It is a 10 minute taxi ride from the Mamsha touristic area with its numerous bars, restaurants and shops. 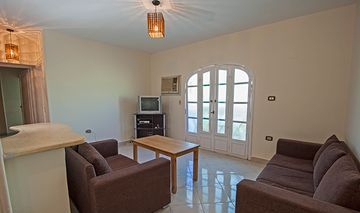 The apartment is a one minute walk from the main road where taxis and buses can easily be found. Serafy has security gates at both its entrances with security guards on duty throughout the night. Close to local beaches, water sports, and many more activities. Mubarak 2, El Kawther, Hurghada - Newly refurbished 2016. Fully furnished, turn key ready. This large 2 bedroom apartment for sale, is located in Mubarak 2, a purpose-built estate within walking distance of the new El Kawther area with its shops, cafes and restaurants and a very short taxi ride from the Mamsha touristic area with its numerous bars, restaurants and shops. The main centre of Hurghada is a 10 minute taxi ride away and the apartment is a two minute walk from the main road where taxis and buses can easily be found. Significantly reduced from £19000, for quick sale by the owner. Tiba Resort, Al Ahyaa, Hurghada - Brand New, Unfurnished, 50m2, 1 Bedroom apartment for sale, with balcony overlooking the pool. Fully finished to a high standard, includes 2 air conditioning units. Tiled throughout. White porcelain bathroom furniture. Ready to make your own, for living accommodation, or rental investment. An absolute bargain at £16000 GBP. Tiba Resort - is a brand new development, located 20km North of Hurghada, and around 5km South of El Gouna. Only 500mtrs to the nearest beach.